Our Mission is to provide the youth of the Greater Cincinnati Metropolitan Area, the highest quality youth sports program. The Association believes that participation in team sports can be an important ingredient in healthy youth maturation. The Lady Norse in Nashville during the 2011-2012 season. If you are interested in playing for the Lady Norse U16 team for the 2012-2013 season, please contact Coach Rob Yake at Cell 513-673-5972. We are still looking for a few more players to fill out the roster, girls ages 11 through 16 are welcome. 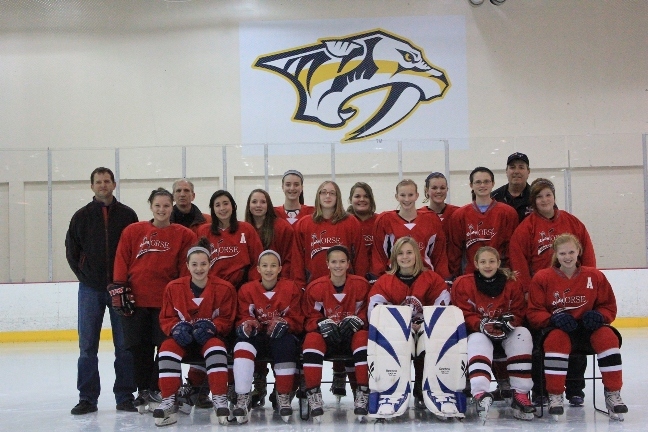 The Lady Norse play in the Heartland Girls Hockey League. How it works is we play 5-weekends throughout the winter at different locations four games each weekend. Nashville, Northern Kentucky, Indianapolis, Owensboro, Columbus and Louisville are the possible locations.